Recall that the HorizontalAlignment and VerticalAlignment properties specify how child controls should be located and sized within their parent container. 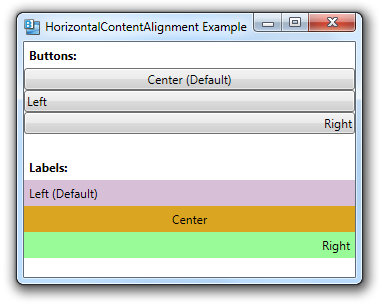 The HorizontalContentAlignment and VerticalContentAlignment properties are similar, but specify how a control’s content should be aligned, within the interior of the control. Below is an example of some non-default values for HorizontalContentAlignment.